Ok, the number one spot was a surprise. Who ever thought Oprah won’t top this list? Well she didn’t this year, Lady GaGa did. Oprah was the list’s #2. 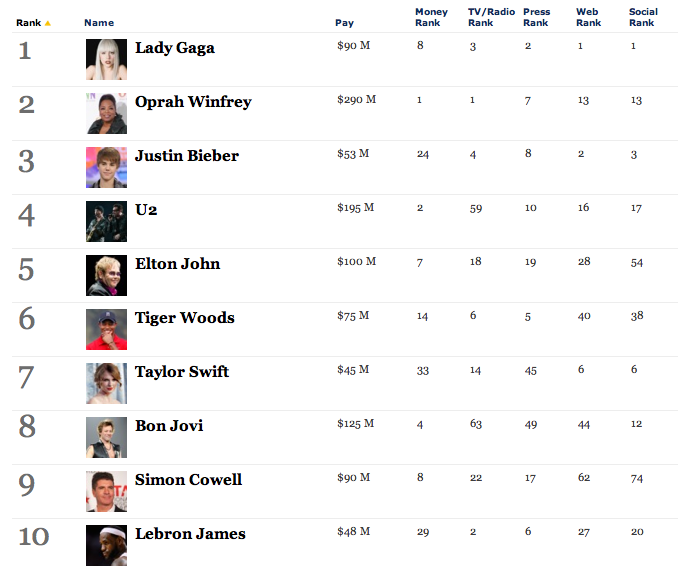 Lady GaGa sure deserves to be on top. She’s got like 30 million Facebook fans, 10 million Twitter followers, and has topped the charts with almost every single she’s ever made; not to mention her own GaGaville\Farmville game. That’s true power. You can view Forbes’ complete list here.